Box Text: He's back! 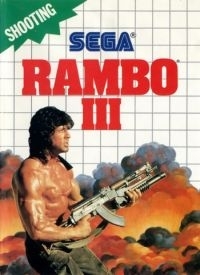 Now, live the movie Rambo III on your Sega System! Colonel Trautman has been captured by the Soviet forces in Afghanistan. The C.I.A. is ready to leave him there. They are afraid a rescue mission will cause an international incident. You don't care what it causes. Trautman is your friend...and you're going in to get him back! 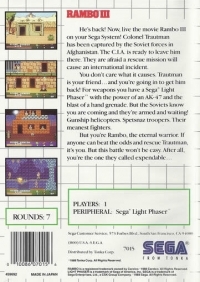 For weapons you have a Sega Light Phaser with the power of an AK-47 and the blast of a hand grenade. But the Soviets know you are coming and they're armed and waiting! Gunship helicopters. Spetsnaz troopers. Their meanest fighters. This is a list of VGCollect users who have Rambo III in their Collection. This is a list of VGCollect users who have Rambo III in their Sell List. This is a list of VGCollect users who have Rambo III in their Wish List.